This painting by the contemporary artist, Denis Dighton was exhibited in 1815 and is now owned by the Marquess of Anglesey. It shows the 7th Hussars charging French infantry in the foreground. They are depicted wearing shakos with oilskin covers, a detail that may well be true. 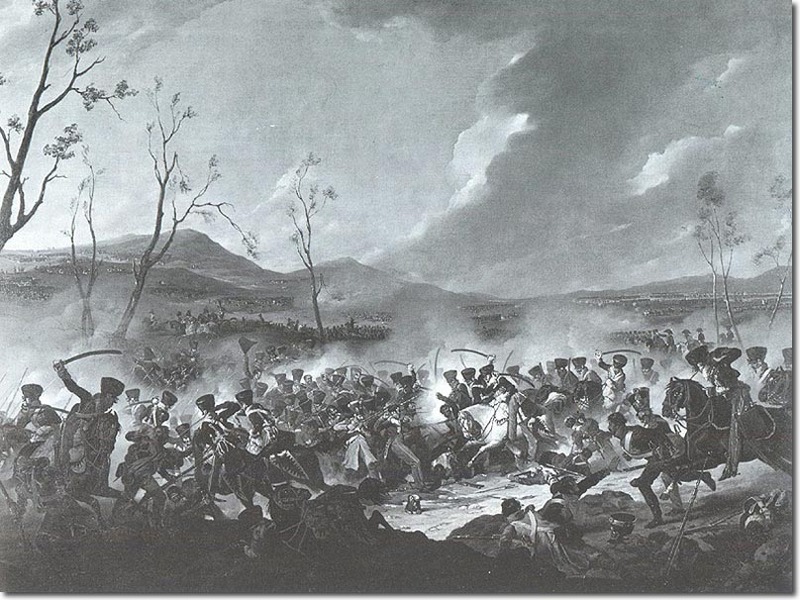 Other contemporary prints such as the one by Hamilton Smith have the hussars wearing busbies in the Corunna campaign. The regiment may well have decided that the busby was unsuitable for Peninsular warfare. The men are distinguished by the white sheepskin saddle cover, while an officer, on the right of the picture has a black sheepskin with a white edge.